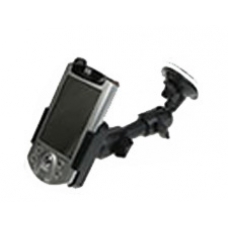 Heavy Duty PDA car holder is an iPAQ mount ideal for using your iPAQ in car with satellite navigation or GPS software. Your unit is secured safely to your windscreen or dashboard with these high quality German built mounts. Whilst extremely robust the mount system is also highly flexible, with both 360 degrees rotation and an included extra long barrel making the device extremely easy to use and to adjust. The suction mount maintains your iPAQ vibration free on the dashboard or windscreen. iPAQ shown for illustration purpose only and is not included. We are so confident in the high build quality of our iPAQ holders that they come with a 12 month guarantee. * 360 Degrees Rotating Swivel Mount for Flexible and Secure Positioning. * Included Extra Long Barrel. * Manufactured From High Quality ABS Plastics.